Montgomery – Upon appointment by Governor Kay Ivey, the Alabama Senate confirmed one new member and reconfirmed three other members to the Alabama Community College System (ACCS) Board of Trustees on Tuesday. The Board is the governing body of the ACCS. The Senate confirmed accomplished businessman and Vietnam veteran John Mitchell, to represent District 2 for a four-year term on the ACCS Board of Trustees. He replaces Ron Fantroy, who served from 2015 to this year. Re-confirmed were Board Members Milton Davis, of District 6, Blake McAnally, Member-At-Large, and Matthew Woods, of District 4. Both Davis and McAnally are in their second term on the Board. Woods was sworn in as a member of the Board in 2017. “At the Alabama Community College System, we are laser focused on providing every Alabamian with the tools they need to be competitive in today’s economy. With a combined 13 decades of experience in business and industry, these Board Members understand the importance of high quality, affordable education and training to Alabama’s economy,” said Jimmy H. Baker, Chancellor of the Alabama Community College System. Mitchell is an entrepreneur who owns several automobile dealerships in the southeastern region of the state. “It is an honor and a privilege to represent such a forward-moving body of leadership, faculty and staff members who believe in what they do each and every day for Alabama,” Mitchell said. Mitchell is a past president of the Enterprise Chamber of Commerce and has served in various community service capacities, including leadership roles and membership with the following organizations: Enterprise Lions Club; Coffee County United Way; Wiregrass United Way; Army Aviation Association of America; Association of United States Army-Fort Rucker Chapter; Army Aviation Museum Foundation; Coffee County Arts Alliance; Enterprise High/Enterprise State Community College-Tip-Off Club; Enterprise/Coffee County Economic Development Corporation; City of Enterprise Industrial Development Board; Enterprise Medical Center Board of Trustees; and Enterprise State Community College Foundation Board of Trustees. Mitchell was selected the Enterprise Chamber Retailer of the Year in 2003 and the Coffee County Business Man of the Year in 1996, and was nominated Enterprise Man of the Year in 1994. He is also a member of First Baptist Church in Enterprise. Davis, a registered Professional Engineer and experienced businessman in market analysis, strategic planning, risk analysis and contract negotiations, is Director of Industrial Business Development at BL Harbert International, LLC. He began his service to the Board in 2015. 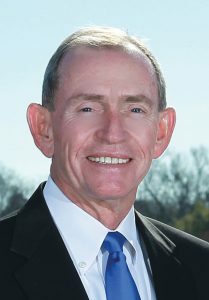 McAnally, whose first term also began in 2015, became the third owner and president of Pugh Wright McAnally, Inc. Civil Engineering and Land Surveying in 2004. With more than 14 years of experience with a national multi-discipline engineering and environmental firm, he is well-versed in civil engineering for site grading and drainage plans, stormwater management plans, roads, utility systems and commercial development. Woods is a second-generation entrepreneur and Manager of Jasper Auto Sales with experience in recruitment, fundraising and event planning for business and industry. A community college graduate, Woods has been an active supporter of his alma mater, Bevill State Community College, where he served as a student ambassador and president of the Student Government Association at the Jasper Campus.